When you get a cramp like that one, just put your hands together with your fingers intertwined and use the cradle you've created under your toes, then pull up while straightening out your leg at the knee. This will stretch out the cramping muscle and the cramp is gone immediately. #1 When you get to a certain age, just the thought of trying to get your intertwined fingers to reach under your toes is likely to cause one of those neck cramps you can get, then you are in trouble. Always carry a little piece of wood just winder than your mouth no more than half an inch thick and as long as you have your own teeth bite down until you pass out and when you wake up the cramp will either be gone or you'll be in hospital with mouth splinters simples. #1 is right! 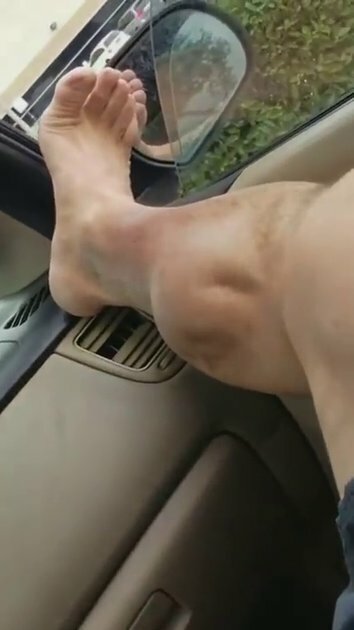 Yes, it is possible to flex your foot towards your knee and the cramp will release itself instantly, but you can get one in the opposing muscle by your shin that way, which happens to me sometimes, then hold your foot just horizontally level, and both will release, or stand up and walk them out. Also, you may be low on magnesium or calcium or dehydrated.